"Fashion Designers of Their Time"
The house of Frankfurt-am-Main were a firm of the first rank in the great city of finance. The house was one of the youngest in 1896 and most progressive of Europe. 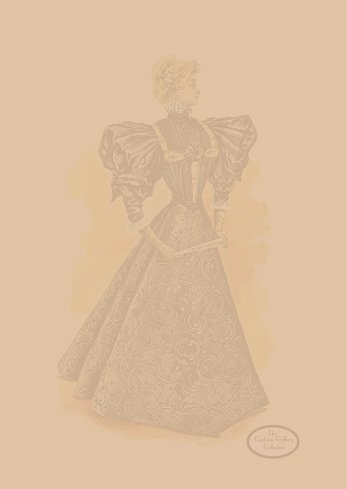 It made a specialty of jackets, adopting the "genres"of Vienna fashions. Please look through our Table of Contents below. To VIEW the image enlargements in this section, you must have a subscription from The Costume Gallery Library. IF you do not have a subscription, please click HERE. Subscribers may click on the images below to view the enlargements. This area of our Library may have articles/descriptions in French and English languages. Marshall Field & Co.: Illustrated Catalogue: Jewelry & Fashions. Chicago, Illinois, 1896. Disclaimer: This article is being presented as an educational resource of women fashions during this time era. The Costume Gallery, or its owner, Penny E. Dunlap Ladnier, does NOT sell or make sewing patterns. This publication's text is in its original format. Spelling or grammar may not appear to be correct, but were standard for the original publication date. This image may NOT be downloaded to your computer, but you do have permission to print one copy of this webpage. Copyright, 2004-2007, The Costume Gallery Questions??? email click HERE. © The Costume Gallery, 1996-2008. | © Costume Research Library, 1996-2008. © Costume Classroom, 2001-2008. | © A Year in Fashion 2000-2008. © Fashion Designers of Their Time, 2004-2008. | © Costume Encyclopedia, 2004-2008. © Fashion Color Database, 1996-2008. | © Fashion Foto-date, 2000-2008. © Costume Slideshows, 2008. | © Fashion & Textile Dictionary, 2008. © pasthair.com & pasthairstyles.com , 2008.